I've been arguing over at Tallbloke's. It's one of those posts where a sceptic does an elementary analysis and makes elementary errors which contradict "consensus" science. A new scientific discovery is announced. Being Galileos, they don't have to check their work. The sceptic here is Hans Jelbring. He looks at a simple problem, two concentric spheres without heat sources, and checks their radiation balance to find what the temperature difference should be. Consensus science says, of course, that there should be none, but he found one, and then spent time working out the resulting perpetual motion machine. I'm not sure what was the point of that, but Trenberth was mentioned. I have sometimes done these analyses myself, being intrigued when what looks like a problem determined by geometry turns out to have a solution constrained by the Second Law of Thermodynamics (2LoT). Given the complexity, that can look like a miracle. When you have concentric convex shapes, the radiation from the inner one ends up on the outer one. A really rookie mistake you can make is to expect the converse. Since the outer surface is larger, the inner body ends up being very hot. Hans managed to make that error here (case II, pipes). But he avoided it in the main post, which concerned spheres. There he noted, correctly, that he needed to calculate how much of the radiation from any one outer point impinged on the central body, and how much missed. So he drew a plot which you can see there, but which I'll modify to the one at right. There is a small surface element at dA on S2, the outer sphere. Some of its emission, in a cone angle α impinges on S1. The rest misses and ends up back on S2. The total emitted by dA is given by the Stefan Boltzmann relation $$F= dA\ \sigma \ T_2^4 $$ To get the fraction within the impinging cone, we want the part of that that would impinge on the surface S (if S1 wasn't there). Hans made here a common error of assuming that the radiation from dA is as for a sphere, uniform in all directions. Then you can just divide the area of S by the area of the hemisphere of which it is part. But dA is flat, and does not radiate uniformly. In fact, in its own plane it doesn't radiate at all (think of seeing a disc side on). There is a Law and theory applicable here. It's called Lambert's cosine law, and says that the intensity of radiation is proportional to cos θ, the angle from the normal. So that tells how the radiation incident on S should be summed. An integral is needed. You can imagine a ring element formed by an increment in θ. Its surface area will be \(dS = 2\pi\ r^2\ sin \theta d\theta\). And if the impinging radiance is \(I(\theta) = I_0\ cos \theta\) W/m2, then the total on S will be $$ I_0\int_\alpha^0 cos\theta dS = 2\pi\ r^2\ I_0 \int_\alpha^0 cos\theta\ sin\theta\ d\theta = \pi\ r^2\ I_0\ (1 - cos^2 \alpha) = \pi\ r^2\ I_0\ sin^2 \alpha$$ We can relate I0 to F by using this formula for the hemisphere, which catches all the radiation. The lower integration limit is then not α, but π/2. So $$ F = \pi r^2 I_0$$ So the power dP transferred from dA to S1 is $$dP = F\ sin^2 \alpha = dA\ \sigma\ T_2^4\ sin^2 \alpha$$ Integration over dA is just summation, so the total power P2 from S2 to S1 is $$ P2 = 4\pi R2^2\ T_2^4 sin^2 \alpha = 4\pi R1^2 T_2^4 $$ which exactly matches the Stefan-Boltzmann emission from S1 if \(T_2=T_1\). The discussion on the Tallbloke thread was quite interesting, though Hans seems to have dropped out. DocMartyn posed the problem - what if S2 was a conducting shell in space and S1 had a heat source (Pu) generating 300W. He simplified with S2 as 2 sq m and S1 as 1 sq m. He asked what the temperature of S1 would be. It's actually enough to work out the fluxes from each body. The above reasoning is useful here. We can say that 300W has to be radiated out to space, and the 150 W/m2 sets the temperature of S2. It means also 150W/m2 is radiated inward. An amount P of this is absorbed by S1, which then radiates in total 300+P W.
To get P, imagine that the 300 W was now generated within S2 rather than S1. Surprisingly perhaps, this does not change the temperature of S2. It still radiates 300W outward and inward, of which P arrives at S1. But now we know that S1, with no source, is at the same temperature as S2. So it radiates 150 W outward (its area is 1 sq m). And P is what comes in, so P=150. An interesting aspect of this reasoning is that nothing was said about spheres. If you allow the bodies to be conductive enough to keep their temperature uniform, they could have been any reasonable shape, though you have to account carefully if S1 isn't convex. I think DocMartyn chose his numbers with a common shell model of the greenhouse effect in mind. There's a fairly simple generalization which doesn't require the bodies to be spherical or concentric (though they need to be convex). Each has to be at a uniform temperature, which will generally require perfect conductivity. Suppose that S1 and S2 have respective areas A1 and A2, and there is a power source P watts. Start by assuming that is on S2. Then it must radiate P outwards, creating an emittance P/A2 W/m2. That forces (S-B) a temperature T0. All this is steady-state, black-body. Then S1 must also be at T0, and so also emits P/A2 W/m2. For power balance, this is also what it receives. Now suppose P shifts to body S1. S2 still has to emit P W, so is still at the same temperature. So the environment of S1 hasn't changed, and it still receives P/A2 W/m2, or P*A1/A2 W. But with the extra source, it must now emit P*(1+A1/A2) W, or emittance P*(1/A1+1/A2)W/m2. That determines its temperature. Hansen's 1988 predictions - a JS explorer. 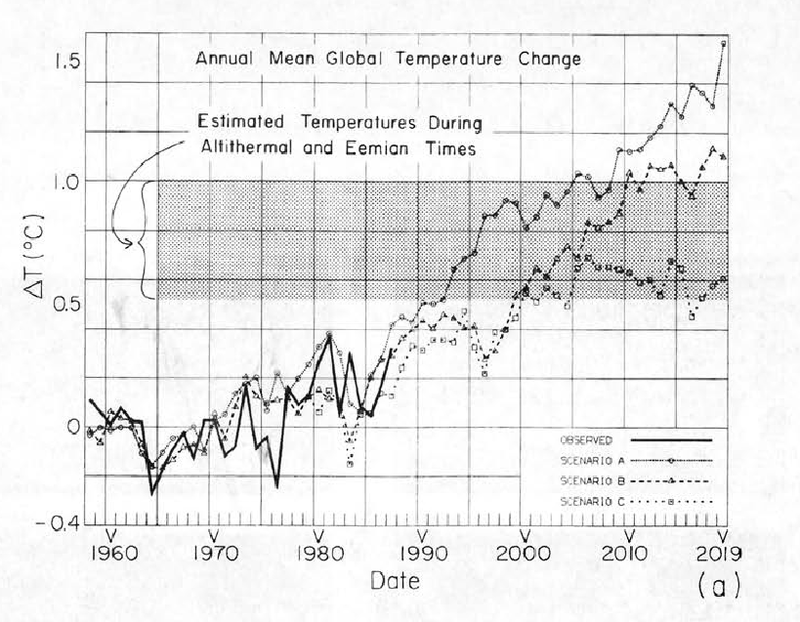 Hansen's famous 1988 paper used runs of an early GISS GCM to forecast temperatures for the next thirty years. These forecasts are now often checked against observations. The forecasts are subject to scenarios, which are often misunderstood. A GCM can calculate all sorts of things, but some have to be supplied as inputs. CO2 is the most notable; climate science can't predict how much carbon will be burnt. Volcanoes are another. But there is also TSI, other trace gases. More marginal is ENSO. Only recently have GCM's been able to compute it, so it can make sense to treat it as a forcing, subject to scenario. Scenarios are not predictions. You have to calculate a range of them to have a chance of getting a result that will correspond to what really happened. When you look back, the sole test of which scenario to apply is what corresponds best to the history. It doesn't matter what Hansen or anyone esle thought was likelier. You check against the scenario that fits what happened. However, I'm not talking here about scenario confusion, but a more basic issue - what observation dataset to use. It's prompted by a post today at WUWT in which the predictions were rated against satellite indices for the lower troposphere. That certainly wasn't what Jim Hansen was predicting. We know what actual index he had in mind, because he graphed it against model results. It was the index compiled from meteorological stations, described in the paper of Hansen and Lebedeff 1987, the year before. This eventually became the GISS Ts index. I believe that is the index that should be looked at first. The more modern Land/Sea indices were not available in 1988. However, there is an argument that Land/Ocean indices are a better representative of GMST, and Real Climate, in their periodic reviews of model predictions and observations, use the GISS and Hadcrut Land/Sea indices. I think this is a little unfair to Hansen, as they rose more slowly than the GISS Ts. But there is a rationale. So here is where a JS/HTML 5 graphic can help. I found out how to incorporate bitmaps in HTMS 5 canvases, so today's active plot allows you to choose from a wide variety of indices, and superimpose them on Hansen's original graphic. With multiple indices there is always an issue with differently calculated anomalies. Here I used the GISS Ts index unchanged; it does (still!) match Hansen's observed data in the overlap period. I then shifted the other indices so that they would have the same average as GISS Ts from 1980 to 2009 (30 years). But I've allowed users to modify this offset if they have a better idea. So here is the plot. Below is advice on how to use it. In a few posts I have been showing plots of all possible trends that you could calculate from global temperature time series, with some emphasis on statistical significance. The original post just showed trends; the next showed trends that lacked statistical significance in faded colors, and then I tried to show more detail with plots of confidenced limits and t-statistics. The plots are available for various land, ocean and combined datasets. I added SST at some stage, and the various gadget capabilities improved. There are some similar posts with special datasets. I did some more programming to allow a fuller set of summary statistics when you click on the main plot. So I thought it was a good time to gather the various facilities in a single plot, since they use the same dataset. You can select the variable to display - just trend, trend with significance marked, or the upper or lower confidence limit (CI), or the t-statistic, which is the ratio of the calculated trend to its standard error. With each dataset selection, a graph of the time series appears top right. There are two balls, blue and red, indicating the ends of the selected trend period (showing the trend). You can click on the red and blue bars to change this selection; there are also nudgers at each corner of the plot. The triangle plot has the start of the trend period on the y-axis, and the end on the left. You can click on any point to show details. There appear next to the plot on the right, and the time series plot will update to show the trend. At the bottom right is a url which incorporates the current state. You can copy it to use as a link; it will bring up the post with the selections as you had them when you copied. GHCN V3 homogeneity adjustments - revised data. A study of GHCN V3 homogeneity adjustments.